This paper reports on a study on the intelligent cooperation control system with human operators. 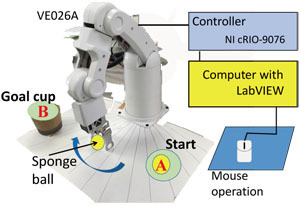 The remote operation of a robotic arm by a human operator is considered as a simplified resilient system. In the experiments, subjects operated a robotic arm to carry out a simple task, while observing it through a monitor. The display of the monitor suddenly disappeared, and the subject continued the task only by using auditory information. By analyzing the relationship between task performances and types of auditory information through a mathematico-statistical method, it was found that not only auditory information related to the position but also the auditory information to ideate the position of the robotic arm was effective for task completion. H. Takahashi, “A Preliminary Study on the Handling of a Robotic Arm Based only on Temporarily Provided Auditory Information as a Substitute for Visual Information < The Case Study that Assumed the Resilient System Architecture >,” J. Robot. Mechatron., Vol.29, No.2, pp. 406-418, 2017. J. Snyder, “Audio Description: The Visual Made Verbal,” California State University, Northridge Conf. 2006, 2006. T. Nishimoto, A. Mitsube, and T. Watanabe, “An analysis of the sports commentaries in radio programs,” The Institute of Electronics, Information and Communication Engineers Technical Report, WIT2006-6 , pp. 27-32, 2006 (in Japanese). J. J. Gibson, “Ecological approach to visual perception,” Houghton Mifflin, 1979. M. Iwata and T. Onisawa, “Linguistic expressions of picture information considering connections between pictures,” Electronics and Communications in Japan (Part III: Fundamental Electronic Science), Vol.86, No.12, pp. 38-53, 2003. S. Matsuo, A. Kikuchi, J. F. Morris et al., “Guaranteeing Equal Access to lnformation and Plain Japanese as a Means of Equal Participation for Everyone: Specific Problems and Shared Aspects between Foreigners , Deaf and Hard-of-hearing People, and People with Intellectual Disabilities,” The Japanese Journal of Language in Society, Vol.16, No.1, pp. 22-38, 2013 (in Japanese). A. Honda, H. Shibata, J. Gyoba et al., “Newly Developed Studies on Three-Dimensional Virtual Auditory Display: Transfer Effects of Playing Auditory Virtual reality Games,” Trans. of the Virtual Reality Society of Japan, Vol.12, No.4, pp.487-496, 2007 (in Japanese). B. N. Walker and J. Lindsay, “Navigation performance with a virtual auditory display: Effects of beacon sound, capture radius, and practice,” Human Factors: The Journal of the Human Factors and Ergonomics Society, Vol.48, No.2, pp. 265-278, 2006. K. Minamizawa, S. Kamuro, N. Kawakami, and S. Tachi, “Haptic Interaction with Virtual Objects in Midair using a Finger-worn Haptic Display,” Trans. of the Virtual Reality Society of Japan, Vol.13, No.4, pp. 415-420, 2008 (in Japanese). G. Moy, C. Wagner, and R. S. Fearing, “A compliant tactile display for teletaction,” Proc. IEEE Int. Conf. on Robotics and Automation 2000 (ICRA’00), Vol.4, 2000. Y. Kouno, M. Ishii, Y. Koike et al. “A proposal of real-time haptization system for untouchable objects,” Trans. on Virtual Reality Society of Japan, Vol.4, No.4, pp. 679-684, 1999. T. Shimizu, T. Sakai, and T. Handa, “Vibration Presentation and Powered Mechanical Leading Method Using Tactile Display for Visually Impaired People,” NHK STRL R&D, No.154, pp. 30-37, 2015 (in Japanese). Y. kouno, M. Ishii, Y. Koike, and M. Sato, “A Proposal of Haptization System for the Visually Impaired,” Image Information and Television Engineers Technical Report, Vol.23, No.31, pp.33-38, 1999 (in Japanese). H. Maruyama, “Towards systems resilience,” 2013 43rd Annual IEEE/IFIP Conf. on Dependable Systems and Networks Workshop (DSN-W), 2013. E. Hollnagel, D. D. Woods, and N. C. Leveson, “Resilience engineering: concepts and precepts,” Ashgate Publishing, Ltd., 2007. C. S. Holling, “Resilience and Stability of Ecological Systems,” Annual Review of Ecology and Systematics, Vol.4, 1973. Longstaff et al., “Building Resilient Communities,” Homeland Security Affairs, Vol.6, No.3, 2010. R. S. Legaspi and H. Maruyama, “Meta-Theory and Machine-Intelligent Modeling of Systemic Changes for the Resilience of a Complex System,” Proc. of Tenth Int. Conf. on Systems (ICONS 2015), 2015. J. Chandra, “A Framework for Robust and Resilient Critical Infrastructure Systems,” JACIII, Vol.10, No.3, pp. 265-269, 2006. Denso wave incorporated, “GP Operator / Academic Robot publicity matter,” 2011 (in Japanese). A. Dasilva, “Small Robotic Arm Starter Kit,” Japan National Instrumnets, 2011. Japan National Instrumnets, “Educatinal Robotic Arm Set-up Manual,” 2012. H. Takahashi, “A Preliminary Study on Resilient Humna-Machine Interface,” The Japan Society of Mechanical Engineers annual meeting, J1630104, 2014 (in Japanese). C. Hayashi, “On the prediction of phenomena from qualitative data and the quantification of qualitative data from the mathematico-statistical point of view,” Annals of the Institute of Statistical Mathematics, Vol.3, pp. 69-98, 1951. J. Lin, “Feature extraction of machine sound using wavelet and its application in fault diagnosis,” NDT & E Int., Vol.34, No.1, pp. 25-30, 2001. S. Harnad, “Grounding Symbolic Representation in Categorical Perception (Ph.D. thesis),” Princeton University, 1992. J. McCarthy and P. J. Hayes, “Some Philosophical Problems from the Standpoint of Artificial Intelligence,” Machine Intelligence, Vol.4, pp. 463-502, 1969. V. R. Lesser and L. D. Erman, “Distributed Interpretation: A Model and Experirnent,”IEEE Trans. on ComPuter, Vol.29, No.12, pp. 1144-1163, 1983. I. Arel, D. Rose, and R. Coop, “DeSTIN: A Scalable Deep Learning Architecture with Application to High-Dimensional Robust Pattern Recognition,” AAAI Fall Symposium: Biologically Inspired Cognitive Architectures, 2009.